Evenin' all! Welcome back to The Mad Shaman's Brewery! In my eternal search to figure out what sort of jank works for me in Pauper, we are brought to my newest pile of cards, a Vehicle deck in pauper. 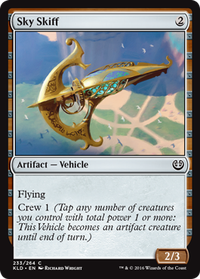 Its built to crew the vehicles for better damage, all the while getting neat little effects like pinging the opponent. Can i get some thoughts, opinions, and helps?